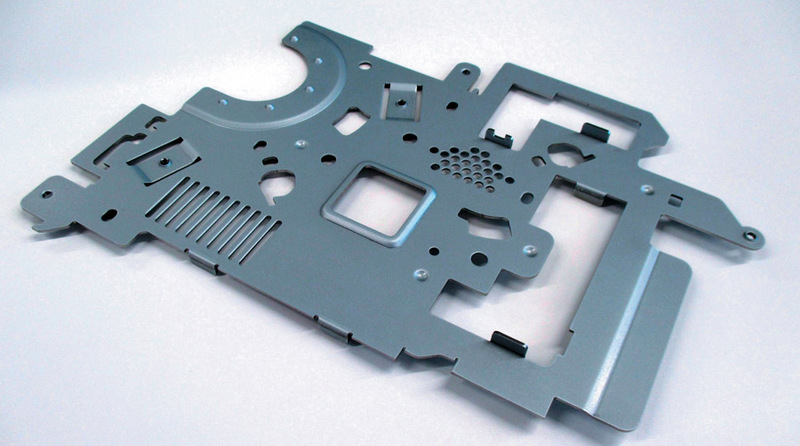 A lot can be said for a top-notch punch press or laser cutter. Either is an important part of the sheet metal processing landscape. Throw a press brake and maybe a welder into the mix and there’s little you can’t make. Yet lasers are limited to flat parts, and they can’t tap holes or form louvers and countersinks. Punch presses, on the other hand, require expensive tooling, especially when odd shapes are called for. 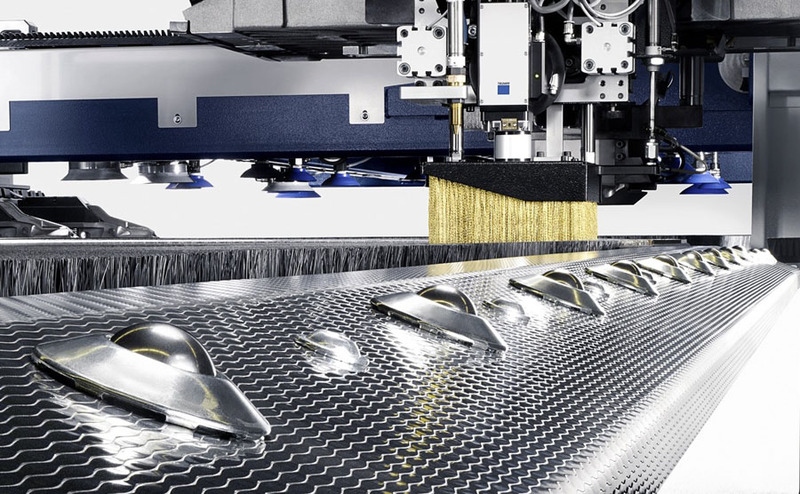 Nibble marks and burrs are common, giving lasers a slight edge in part quality. Granted, punch presses can knock out holes like there’s no tomorrow, but for materials greater than 5/16 in. or so in thickness or for complex part profiles, a laser is the clear winner. 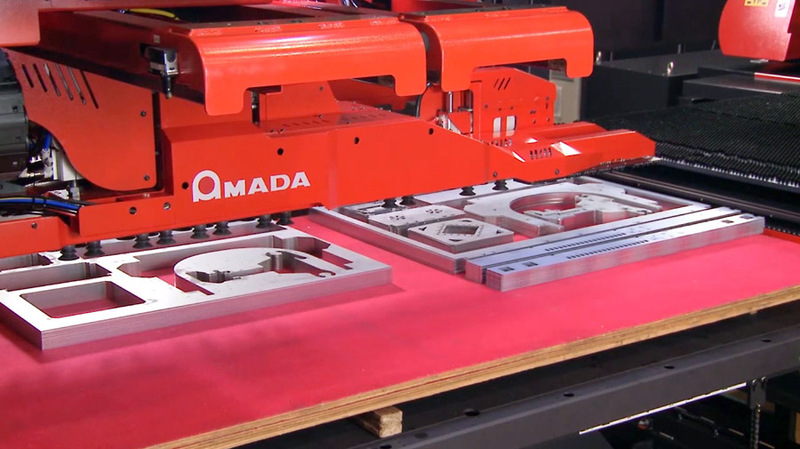 With robotic parts handling, parts leave most punch/laser combo machines stacked and sorted, ready for bending, welding or other secondary operation. Wouldn’t it be swell then if you could pick and choose the best attributes of each type of machine? If that was possible, you might not have to look at stacks of partially completed parts sitting around the shop floor, waiting for the secondary operations that neither machine is able to complete on its own. A sample part showing the various operations possible on a punch/laser machine, including extruding, tapping, embossing, offset flange forming, lancing and laser cutting. As it turns out, you can pick and choose. Punch/laser combo machines offer the best of both worlds, and with a few additional capabilities to boot. Considering that this two-in-one technology has been around for decades, it’s a tad perplexing that so few shops avail themselves of its benefits. The problem is the cost. Where a combo machine is clearly a two-fer in terms of capabilities, its price tag is quite close to that of a punch press and laser combined. For those who don’t have the right kind and amount of work for a combo machine or where floor space is not a premium, the argument is simple: Why buy a Swiss Army knife when a pair of Leathermans will do? 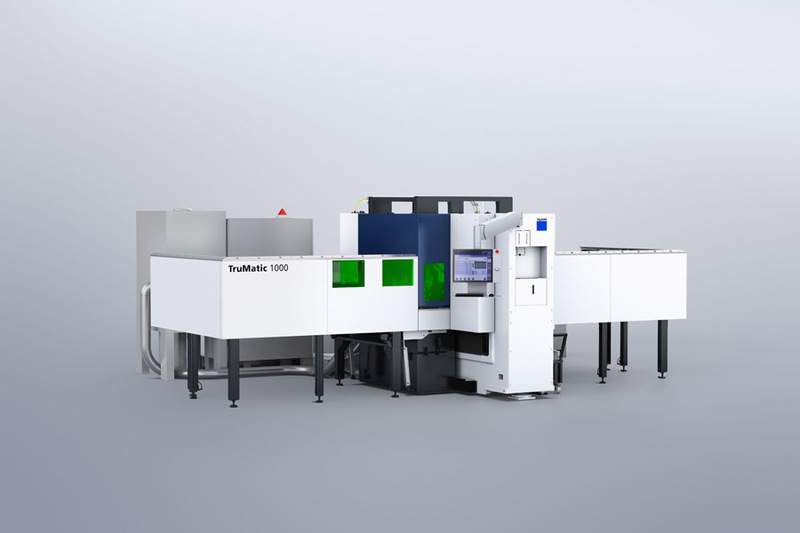 A modular machine design allows customers to field-retrofit a laser module to their punch press years after installation. Brady offers several reasons why this way of thinking might be flawed. A shop that doesn’t do any forming or tapping will get by just fine cutting everything on its laser. A shop that produces parts with lots and lots of small holes will almost certainly see faster cycle times on a punch press. And a shop that doesn’t have to worry about labor costs or high amounts of work in process will see no value in a punch/laser combo machine. For everyone else? Combos are definitely worth considering. Automated parts sorting eliminates the morning “shake and take” workout that shops have begrudgingly come to accept as a part of doing business. Automation is another big factor. 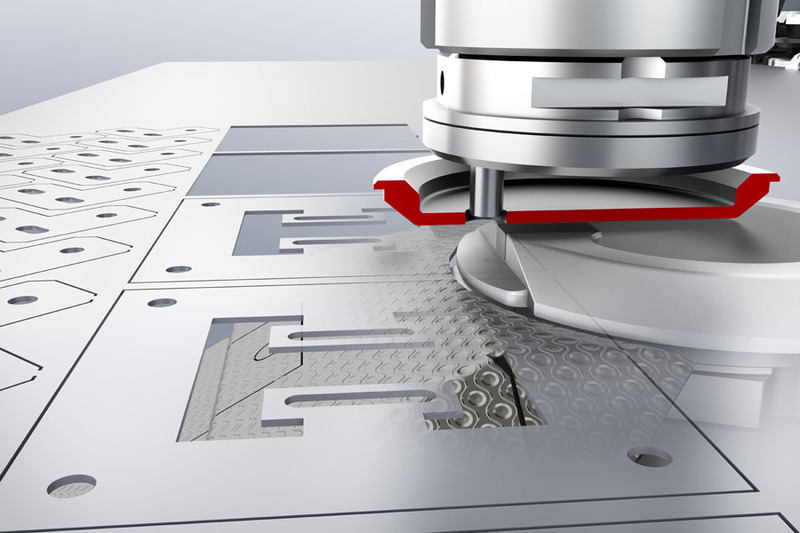 Combo machines allow the operator to bring the part to its micro-tabbed conclusion then use the laser to gently release the part to a waiting robot or through a trap door below. 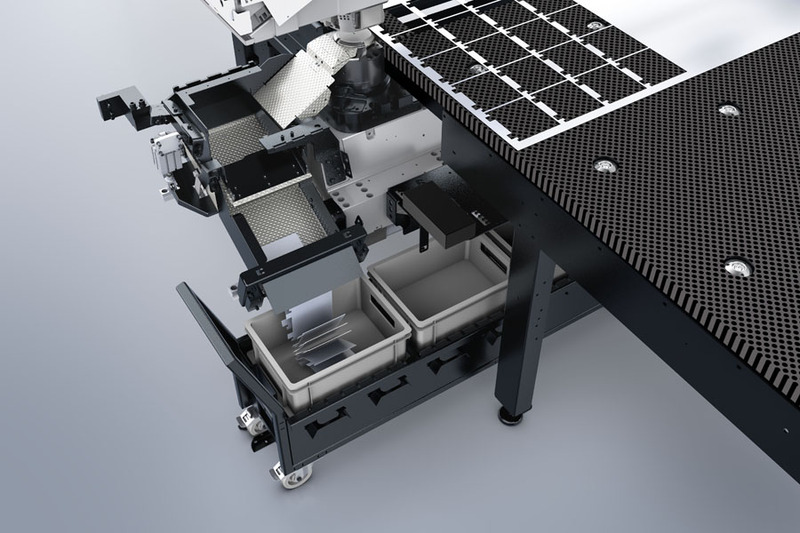 There’s no more hours of laborious “shake and take” whenever a nest is completed – just grab the bin, box, or pallet of parts and carry them to the press brake, or directly to the shipping department. A trap door underneath the work area allows parts to drop through into a waiting bin. No more micro-tabbing and manual parts removal. Taraba says that identifying and eliminating non-value-added time needs to be a top priority for manufacturers. True, cycle time is also important, but there’s no point in cutting or punching a part 10 times faster just to have it sit on the floor waiting for the next operation. 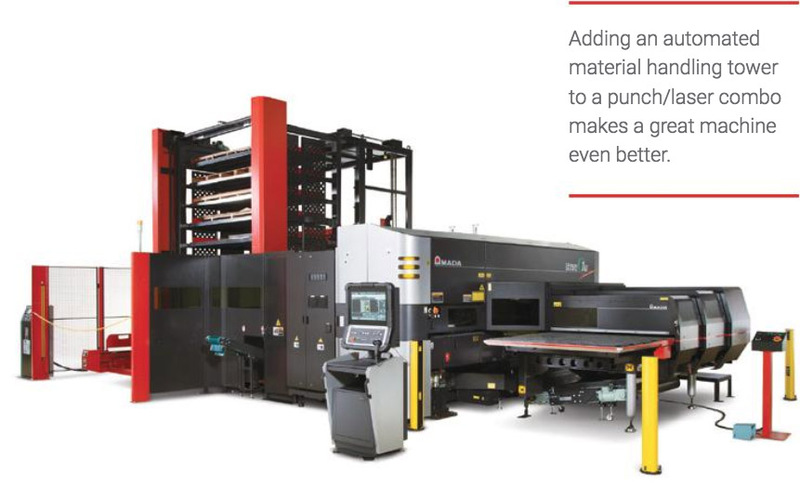 Whether punching, laser cutting or forming, combo machines give shops the ability to use whichever technology is most appropriate for a given operation – thus reducing cycle time – while offering a huge leg up on to shorten lead times and increase flexibility. For example, a laser might take two seconds to pierce a hole, whereas a punch press takes around a quarter of a second, Taraba explains. On a sheet with 500 holes, this makes a significant difference in overall cycle time, so a shop would normally put it on their punch press. Similar arguments can be made for complex profiles. In most cases, these are cut on a laser. With a combo machine, you don’t have to choose which machine is best because everything can be completed in one operation. A shop willing to invest in punch/laser combo technology can gain a significant leg up on the competition. Taraba says that combo machines also have the ability to separate internal scrap – a window or cutout, for instance, that would normally have to be micro-tabbed and removed by hand later – can be automatically “smart ejected” into the scrap bin. Imagine for a moment cutting a sheet containing 10 different parts, each with a mix of punched, formed and laser cut features. With a punch/laser combo machine, there’s no more sorting, no more secondary processing, no more work in process. Every part in the nest comes off the machine complete and is sorted into the appropriate bin with the scrap and skeleton kept separate with no human intervention whatsoever. The only downside of a combo machine is that you might have to purchase a gym membership because the daily upper body workout you and your employees have been getting at the tail end of the punch or laser machine will soon be a thing of the past. Regardless, I think most would still take the combo.